Thoracic systemic venous anomalies when presenting without associated congenital heart disease are usually asymptomatic and found out incidentally while being planned for vascular interventions or other surgeries. Persistent left superior vena cava with absent right superior vena cava is very rare and poses difficulty in positioning of the lead while being planned for permanent pacemaker implantation (PPI). We report one such case who underwent successful PPI. We report another case of sick sinus syndrome who was incidentally found to have interrupted inferior vena cava with azygos continuation while being planned for temporary pacemaker implantation. She underwent successful PPI. We would like to stress the importance of having a high suspicion of the existence of these venous anomalies especially in young patients with sick syndrome. A 30-year-old male presented with breathlessness on exertion. Clinical examination was unremarkable except for bradycardia. Electrocardiography (ECG) showed significant sinus bradycardia with intermittent sinus pauses. Echocardiography (ECHO) showed prominent coronary sinus (CS) with persistent left superior vena cava (SVC) [Figure 1]. Blood investigations were normal. Patient was planned for PPI. 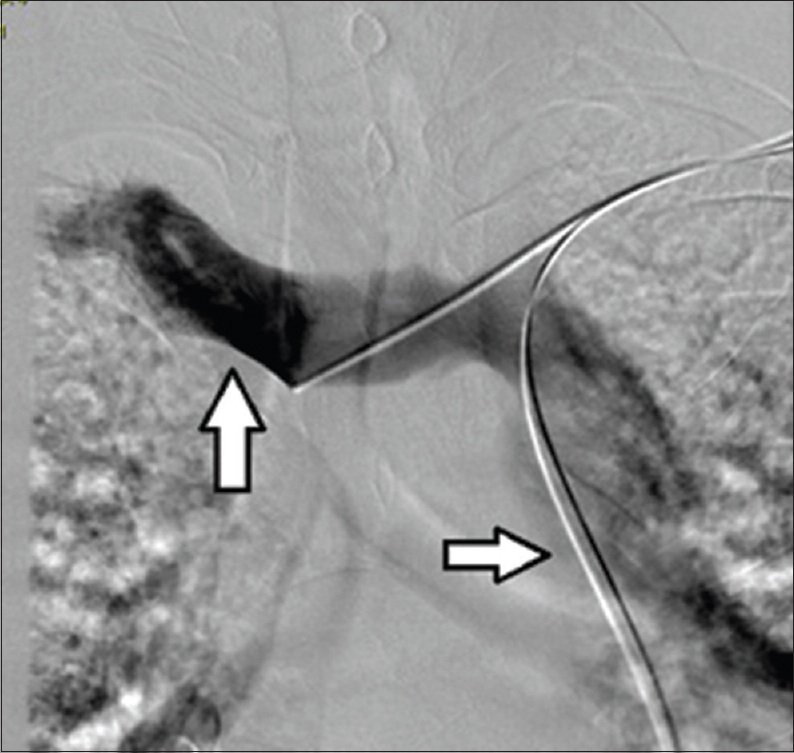 He underwent a venogram that showed persistent left SVC draining into the CS [Figure 2]. Right brachiocephalic vein was draining into the left SVC and in turn into the CS with right SVC being absent [Figure 2]. Left infraclavicular fossa was dissected and extrathoracic left subclavian venous access was taken. When the wire was passed, it entered through the left SVC and CS toward the left side of the spine and in turn into the right atrium (RA), 58 cm passive fixation lead was chosen initially. A sharp curve in the terminal end of the stylet was made to facilitate the entry into right ventricle (RV). Since the positioning of the passive fixation lead in the RV apex was difficult active fixation lead was chosen. With a similar curve in the stylet, the lead was pushed into the RV with a large loop in the RA abutting the free wall for better support [Figure 3]. The lead was screwed into the RV apex with acceptable parameters. Another 58 cm active fixation lead was positioned into the RA appendage with acceptable parameters [Figure 3]. Parameters were rechecked at discharge and during follow-up that remained acceptable. We report another case who is a 30-year-old lady presented with symptomatic bradycardia. Her ECG showed significant sinus bradycardia and sinus pauses. Her routine blood parameters were normal. Chest skiagram and ECHO was unremarkable. She was planned for temporary pacemaker implantation followed by PPI. Right femoral venous access was taken and attempts to cross the tricuspid valve from the RA failed. A venogram through the right femoral venous access showed an interrupted inferior vena cava (IVC) with azygos continuation that in turn drains into SVC [Figure 4]. Patient finally underwent PPI in the left infraclavicular fossa with a screw in lead positioned in RV outflow tract with acceptable parameters [Figure 4]. A persistent left SVC is identified in 0.5% of the general population and 4% of patients with congenital heart disease (CHD). Most commonly when present the left SVC drains into the CS. The left SVC is commonly associated with a smaller caliber right SVC. Persistent left SVC with an absent right SVC is very uncommon and occurs in 0.07 to 0.13% of patients who have CHD. Conduction system abnormalities were reported along with these anomalies. Persistent left SVC and absent right SVC can make central venous access, in particular pacemaker lead insertion and cardiac resynchronization therapy very challenging due to unfamiliar venous course. Preprocedure identification of these abnormalities with ECHO may help us to avoid on table surprises. Various options were tried in these cases for placement of RV endocardial lead. Changing the shape of the stylet once the lead reaches RA through CS is an option that may help us to negotiate the lead across the tricuspid valve. Abutting the lead on the free wall of RA gives better support so that the lead can be pushed across the tricuspid valve. In our case we found it difficult to position the passive fixation lead in the RV apex. So we chose an active fixation lead. There are reports of using long 40 cm worley sheath for better support for RV lead placement. Surgical epicardial lead placement is an option where the endocardial RV lead positioning gets extremely difficult because of unfavorable venous anatomy. Regarding the atrial lead placement, active fixation lead in the right atrial anterior free wall is preferred. But passive fixation lead can be positioned into the atrial appendage. In our case we used a 58 cm active fixation lead into the atrial appendage with acceptable parameters. An interrupted IVC is a rare anomaly with an incidence of 0.6–2% in patients with congenital heart disease and 0.3% with structurally normal heart. It is commonly associated with complex cyanotic heart diseases. Isolated IVC interruption is usually found incidentally during vascular interventions. They may be associated with sick sinus syndrome (as in our case) or complete heart block. In individuals with IVC anomalies, there can be procedural difficulties during right heart catheterization, electrophysiological studies, and temporary pacing (as in our case) through transfemoral approach. Preoperative imaging with ECHO may help in identifying cases of challenging venous anatomy allowing appropriate operative planning and avoid undue delay of an otherwise urgently needed procedure like temporary pacemaker implantation. Subcostal ECHO may show aorta and inferior vena lie anterior to or on the same side of the spinal column and hepatic veins directly drains into the atria. But in most of the situations the interrupted IVC is suspected only during the procedure as in our case. There are case reports of positioning the temporary pacemaker lead via IVC, azygos vein, SVC, RA and in turn into the RV. Transjugular access is an easier option in these cases since SVC drainage is normal. IVC drainage anomaly does not pose any difficulty during the placement of lead in PPI unless there is any associated anomalous SVC drainage. Anomalies of systemic venous drainage need to be kept in mind in young patients presenting with sick sinus syndrome. Preprocedural ECHO may give us a clue regarding these abnormalities and help us to avoid on table surprises. In patients with persistent left SVC and absent right SVC requiring pacemaker implantation, we need to be prepared for difficult right ventricular lead positioning. In cases with interrupted IVC temporary pacemaker lead positioning through transfemoral access is difficult though it can be done. Transjugular access may be an option in this situation. Demos TC, Posniak HV, Pierce KL, Olson MC, Muscato M. Venous anomalies of the thorax. AJR Am J Roentgenol 2004;182:1139-50. MacDonald ST, Emmanuel Y, Myerson S, Prendergast B, Neubauer S, Leeson P. Absent right superior vena cava: Multimodality imaging of upper body venous drainage via left-sided superior vena cava and azygos venous system. Circ Cardiovasc Imaging 2009;2:e34-6. Kumar S, Moorthy N, Kapoor A, Sinha N. A challenging dual chamber permanent pacemaker implantation in persistent left superior vena cava with absent right superior vena cava. J Cardiol Cases 2012;5:122-e4. Mitov V, Perisic Z, Kostic T, Stojkovic A, Jolic A, Aleksic A, et al. An alternative approach for endocardial pacemaker lead implantation in patient with persistent left superior vena cava. Srp Arh Celok Lek 2010;138:85-7. Daccarett M, Pai RK, Abedin M, Segerson NM, Hamdan MH. A novel technique for right ventricular lead placement in a patient with a persistent left superior vena cava. Europace 2007;9:200-1. Belott PH, Reynolds DW. Permanent pacemaker and implantable cardiovertor defibrillator implantation. In: Ellenbogen KA, Kay GN, Lau CP, Wilkoff BL. Clinical Cardiac Pacing Defibrillation and Resynchronization Therapy. 3rd ed. Philadelphia: Saunders, Elsevier; 2007. p. 616-8. Bartram U, Fischer G, Kramer HH. Congenitally interrupted inferior vena cava without other features of the heterotaxy syndrome: Report of five cases and characterization of a rare entity. Pediatr Dev Pathol 2008;11:266-73. Vijayvergiya R, Bhat MN, Kumar RM, Vivekanand SG, Grover A. Azygos continuation of interrupted inferior vena cava in association with sick sinus syndrome. Heart 2005;91:e26. Perloff JK, Marelli AJ. Cardiac malpositions. In: Perloff's Clinical Recognition of Congenital Heart Disease. 6th ed. Philadelphia: Saunders; 2012. p. 37-8.